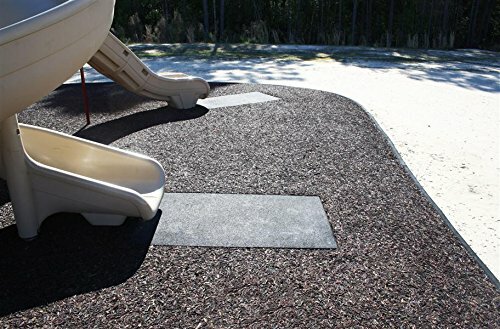 IncStores Playground Slide Mats (2ft x 4ft) For Use Under Swingsets, Slides and Playground Equipment (2ft x 4ft x 2 1/4in, Black) by Incstores at Defy Now. MPN: pslidemat. Hurry! Limited time offer. Offer valid only while supplies last. Description - Playground slide mats are great for both commercial and residential playgrounds and help prevent the spread of mulch, gravel, and dirt. Description - Playground slide mats are great for both commercial and residential playgrounds and help prevent the spread of mulch, gravel, and dirt. These mats are available in two thicknesses and provide added protection for children as they exit any slide. These playground mats are backed by a 5 year warranty. Thickness - Available in 1" and 2-1/4" thick mats. Weight - 1" thick mats are 33 Lbs. and 2-1/4" mats are 65 Lbs. Recommended Uses - Playground slide mats are great for both residential and commercial playgrounds. These mats provide extra protection at slide exits and help prevent the spread of mulch, gravel, rubber crumb and dirt. If you have any questions about this product by Incstores, contact us by completing and submitting the form below. If you are looking for a specif part number, please include it with your message. Heart-shaped Flower Area Rugs-Judy Dre am Non-slip Kitchen Floor Mat Absorbent Bathroom Floor Mat Rug Rural Carpet Bedroom/Living Room/Bedside/Entrance Doormat 19" X 30.7"